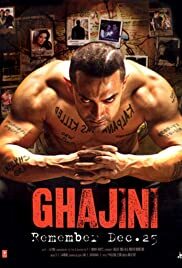 Ghajini is an out an out action thriller set at the backdrop of romance and revenge drama. Its almost a frame 2 frame remake of Tamil hit Ghajini, which was originally inspired by Memento. Since I loved both the versions. It was difficult to expect anything newer or better from the Hindi version. So the verdict would mostly revolve around "did the makers ensure the benchmarks are met". Its a definite 'A' for being able to meet the gigantic expectations. No, the director has not disappointed you. The high points are the few thrills that are part of the narrative, the edge of the seat kinds. While avoiding comparisons, Aamir is done a terrific job playing a confused and furious person in search of the killer of girl friend. His corporate getup was styled differently and looks convincing. I can already sense, the style being a rave shortly in the corporate dressing. His toned up body looks fab, and justifies few of the over the top fights. Asin has won my heart again, din't think she would be able to do so, repeating the feat she did 2 years ago. In few of the reels she literally stole the movie from Aamir. The climax is different and is better picturised. Overall when you leave the theatre you do feel if you missed something.. I can only sum up the following could be why i felt so..
1. I knew the story and could predict the dialogues in advance. 2. The length was a mild problem 3. The action sequences looked dated in parts, one blow and 4 on the ground. 4. The originals were too good to repeat it. Oh I wished, I had the bliss of not having watched the originals, to take a fresh look at it. For the humongous effort of the team, go watch it if you are hungry for masalas beyond cakes and wine this holiday season..